Print, halftone photograph, Wordsworth's Cottage, presumably Ann Tyson's Cottage, Hawkshead, Lancashire, published by C Arthur Pearson, Henrietta Street, London, 1900s. On p.93 of Pearson's Gossipy Guide to the English Lakes and Neighbouring Districts. Photograph, black and white, Ann Tyson's Cottage, Hawkshead, Lancashire, by Herbert Bell, photographer, Ambleside, Westmorland, 1890s. Print, etching? Dame Tysons Cottage, Hawkshead, Lancashire, by Harry Goodwin, published by Swan Sonnenschein and Co, Paternoster Square, London, 1890. Tipped in opposite p.12 of Through the Wordsworth Country, by William Knight. House. 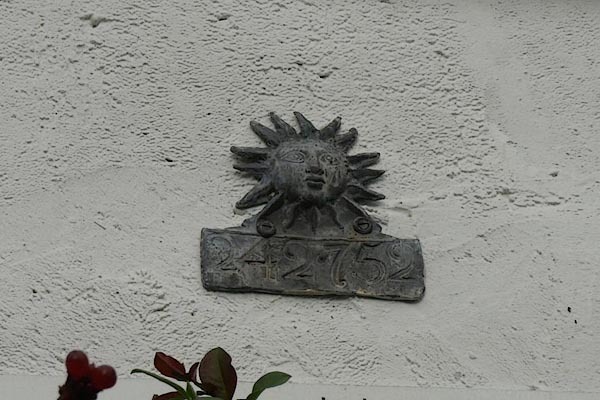 Probably C17. Roughcast with slate roof. 2 storeys, 5 bays, the end bays projecting as gabled wings. Slate dripcourse to central 3 bays. Ground floor has sashed windows with glazing bars to 3rd and 4th bays. 1st floor has casement windows with iron opening lights. 1st bay has steps to 1st floor terrace to return supported on round stone rubble pier, ground floor entrances and 1st floor window with small-paned casement and glazed door. Entrance between 3rd and 4th bays has trellis porch and part-glazed 6-panel door. 5th bay has casement windows, that to 1st floor with iron opening light; left return has small 1st floor window; right return has casement and half-glazed entrance. Cross-axial stack; 1st bay has gable-end stack. 5th bay has projecting return lateral stack with set offs, and cross-axial stack. Interior not inspected, but said to have timber partitions etc. 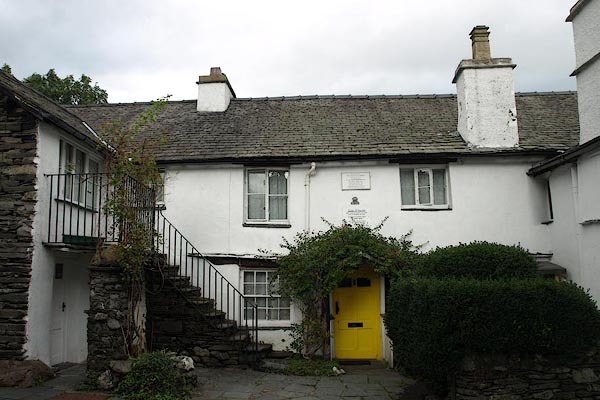 William Wordsworth is believed to have lodged here while attending Hawkshead Grammar School (q.v.). 1st bay wing used as chapel until 1862.